If your mixes are sounding at all stiff, static, lifeless or digital, then this is the tutorial for you! We explore the imperfections of human performance and classic studio gear,and illuminating ways to add realism and organic detail to your productions. Check out this video for a taste of what you'll get in our expert tutorials. Audio Assault have created this new VST/AU effect especially for us from scratch, and we're giving it to you for free with this month's issue. BassAmp CM gives you mix-ready tones with no fuss, and as well as it's obvious use on bass guitar, you can use it on any sound source that needs a dose of attitude and clout. Explore BassAmp CM's sound and read exactly what it's got to offer on the BassAmp CM page, or check out the below video to see and hear it in action for yourself. This month's free sample pack will take you on a magic carpet ride to desert lands. You'll find gongs, drums, flutes and lutes in this massive pack of one-shots and loops, and as always, they're all royalty-free and ready to slot right into your projects. Sampling transformed and shaped the music of the 80s and 90s, and the quirks and limitations of the hardware gave a very distinctive and nostalgic sound - one that you can recreate for yourself using modern software! 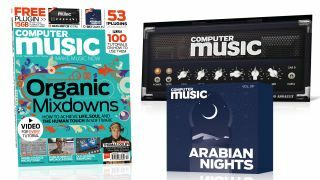 We'll walk you through the techniques and processes required to emulate units like the E-MU SP-1200 and Akai MPC60, and let you in on the methods used by 80s and 90s producers - read all about it in the mag, or check out the accompanying video tutorials. Sonic Charge's drum synth is a modern classic, but do you know how to get the most from it? We do! We'll show you exactly how to use the powerful sequencer, impressive array of synth-sculpting tools and the sound-twisting Morph slider. Over the course of seven walkthroughs - each with a video version - we'll guide you through every aspect of Microtonic, showing you how to use both its basic and advanced functions. Get a preview of this fully charged tutorial in the below video. Take synths, electronic beats, throw in some drums and guitar, then pepper it with sampled archive material, and you've got the sound of Public Service Broadcasting. In this in-studio video, frontman J Willgoose Esq. shows us how he deals with all these components to arrive at the band's unique, complex, indie-electro sound. Watch part 1 below to get a glimpse of how PSB's Gagarin was put together in Cubase, and get the rest of this epic video with Computer Music 224 to get the full lowdown on the production techniques behind the track. Sound Design: This month, Charlie 'Break' Bierman takes the reins from InsideInfo, but this is one substitute teacher you'll want to pay attention to, as he guides you through the making of a filmic delay-soaked pad. Drum Programming: Are you tormented by toms? Pick up the recipe for perfect grooves and fills, and start adding a dash of deep, percussive vibrance to your tunes with this guide. Advanced Mixing: Struggling to compress the incompressible? When you've got a tricky, full-frequency sound which won't settle down, try Owen Palmer's approach to taming the dynamically unpredictable. Music Theory: You may know the concept of musical modes, but how do you actually put the knowledge into practice in your music? Keyboard wiz Dave Clews is on hand to show you how to throw the switch on the right mode over a chord progression. Thomas Dolby: The 80s electro pioneer has returned to music after making his fortune as a Silicon Valley tech revolutionary. How have things changed, and where does he seem music tech going next? Spitfire Audio: Read what Christian Henson has to say about the painstaking process of sampling real instruments to make their virtual recreations. Steve Chandra Savale: The Asian Dub Foundation guitarist lets us in on the software he and the politico-rockers can't get by without.